By a vote of 5-4, the U.S. Supreme Court on March 1, 2005 held that the Eighth and Fourteenth Amendments forbid the execution of offenders who were under the age of 18 when their crimes were committed. When a juvenile offender commits a heinous crime, the State can exact forfeiture of some of the most basic liberties, but the State cannot extinguish his life and his potential to attain a mature understanding of his own humanity. The Court reaffirmed the necessity of referring to “the evolving standards of decency that mark the progress of a maturing society” to determine which punishments are so disproportionate as to be cruel and unusual. The Court reasoned that the rejection of the juvenile death penalty in the majority of states, the infrequent use of the punishment even where it remains on the books, and the consistent trend toward abolition of the juvenile death penalty demonstrated a national consensus against the practice. The Court determined that today our society views juveniles as categorically less culpable than the average criminal. The Court outlined the similarities between its analysis of the constitutionality of executing juvenile offenders and the constitutionality of executing the mentally retarded. Prior to 2002, the Court had refused to categorically exempt mentally retarded persons from capital punishment. 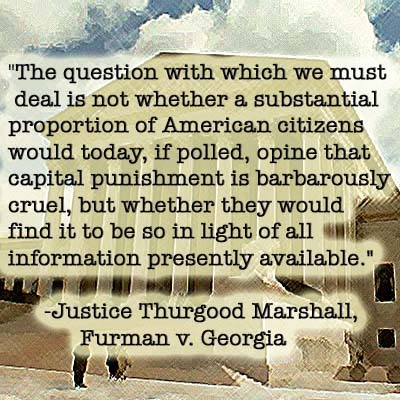 Penry v. Lynaugh, 492 U.S. 302 (1989). However, in Atkins v. Virginia, 536 U.S. 304 (2002), the Court held that standards of decency had evolved in the 13 years since Penry and that a national consensus had formed against such executions, demonstrating that the execution of the mentally retarded is cruel and unusual punishment. Before this historic ruling, the Court concluded in 1989 in Stanford v. Kentucky, 492 U.S. 361 (1989), that the execution of 16- and 17-year-old offenders was not constitutionally barred. The Court now concludes that since Stanford, a national consensus has formed against the execution of juvenile offenders, and the practice violates society’s “evolving standards of decency.” The Court overruled its decision in Stanford, thereby setting the minimum age for eligibility for the death penalty at 18. The Court explained that the primary criterion for determining whether a particular punishment violates society’s evolving standards of decency is objective evidence of a national consensus as expressed by legislative enactments and jury practices. The majority opinion found significant that 30 states prohibit the juvenile death penalty, including 12 that have rejected the death penalty altogether. The Court counted the states with no death penalty, pointing out that “a State’s decision to bar the death penalty altogether of necessity demonstrates a judgment that the death penalty is inappropriate for all offenders, including juveniles. The Court further noted that juries sentenced juvenile offenders to death only in rare cases and the execution of juveniles is infrequent. The Court found a consistent trend toward abolition of the practice of executing juveniles and ruled that the impropriety of executing juveniles has gained wide recognition. In addition to considering evidence of a national consensus as expressed by legislative enactments and jury practices, the court recognized that it must also apply its own independent judgment in determining whether a particular punishment is disproportionately severe. When ruling that juvenile offenders cannot with reliability be classified as among the worst offenders, the Court found significant that juveniles are vulnerable to influence, and susceptible to immature and irresponsible behavior. In light of juveniles’ diminished culpability, neither retribution nor deterrence provides adequate justification for imposing the death penalty. Retribution is not proportional if the law’s most severe penalty is imposed on one whose culpability or blameworthiness is diminished, to a substantial degree, by reason of youth and immaturity. The Court further noted that that the execution of juvenile offenders violated several international treaties, including the United Nations Convention on the Rights of the Child and the International Covenant on Civil and Political Rights and stated that the overwhelming weight of international opinion against the juvenile death penalty provides confirmation for the Court’s own conclusion that the death penalty is disproportional punishment for offenders under 18. Perhaps even more important than our specific holding today is our reaffirmation of the basic principle that informs the Court’s interpretation of the Eighth Amendment. If the meaning of that Amendment had been frozen when it was originally drafted, it would impose no impediment to the execution of 7-year-old children today. Justice O’Connor dissented, criticizing the Missouri Supreme Court for failing to follow the precedent established by the U.S. Supreme Court in Stanford (before the Supreme Court overruled Stanford, the Missouri court in this case concluded that standards of decency had evolved such that executing juveniles was no longer constitutional). 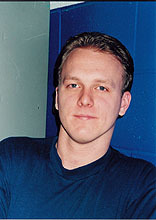 O’Connor agreed that objective evidence presented in Simmons was similar to that presented in Atkins, but while there was no support for the practice of executing the mentally retarded, at least eight states had considered and adopted legislation permitting the execution of 16- and 17-year-old offenders. O’Connor argued that the difference in maturity between adults and juveniles was neither universal nor significant enough to justify a rule excluding juveniles from the death penalty. Justice O’Connor did recognize the relevance of international law, and expressly rejected Justice Scalia’s contention that international law has no place in evaluating Eighth Amendment claims. Justice Scalia, joined by Justice Thomas and Chief Justice Rehnquist, also dissented, arguing that the Court improperly substituted its own judgment for that of the people in outlawing executions of juvenile offenders. He criticized the majority for counting non-death penalty states toward a national consensus against juvenile executions. Scalia also rejected the Court’s use of international law to confirm its finding of a national consensus, stating that “‘Acknowledgement’ of foreign approval has no place in the legal opinion of this Court . . .” Like Justice O’Connor, Scalia criticized the Court for failing to admonish the Missouri Court for its “flagrant disregard” of the Court’s ruling in Stanford. The Court’s ruling in Roper v. Simmons affects 72 juvenile offenders in 12 states. Read the Supreme Court Opinion (March 1, 2005). See also Supreme Court and Juvenile Death Penalty.